Just because mainstream publishers haven’t caught up with the demand for bilingual Chinese-English children’s books doesn’t mean you don’t have options. Do it yourself and you can choose from the best books out there! 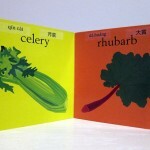 I started with Sara Anderson’s Vegetables because, like the Gordon & Li Li series, it meets my criteria of board book with one page per concept and lots of colors. Since it’s basically a shopping list, I don’t have to worry about grammar or idioms (for the most part). I translated the entire book with the help of Google, using my vestigial linguistic memory to pick the right choice when necessary. Then I assembled the words onto a Word template and printed it onto a clear return address label page. The result is not bad, though on dark color pages the “clear” labels are very visible (which is perhaps a good thing, because those pages have terrible contrast against black ink, my only complaint about the book itself). 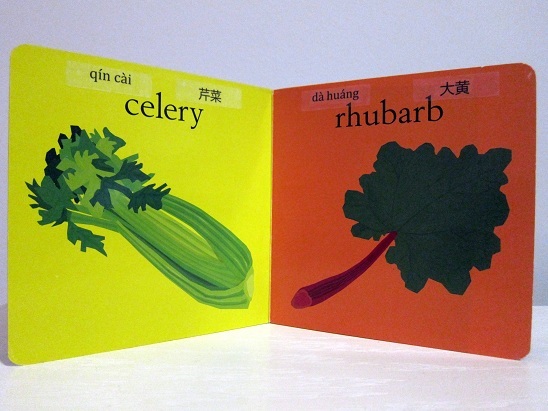 If you’d like to do this one yourself, go get the Vegetables book, download my pinyin and simplified Chinese labels for it, print onto Avery clear return address labels (Avery 18667, which has 4×20 labels measuring 1/2″ x 1 3/4″), and stick them into your book. Voilà: instant bilingual book!